The EMV (Europay, Mastercard and Visa) transition underway in the U.S. is currently impacting small and large martial arts schools that accept credit and debit cards. This standard is steadily replacing the older mag-stripe cards that are easier to counterfeit and subject to more fraudulent transactions. Learn how the transition impacts your school and how PerfectMind EMV/chip terminals can help you reduce fraud liability while saving time and money. 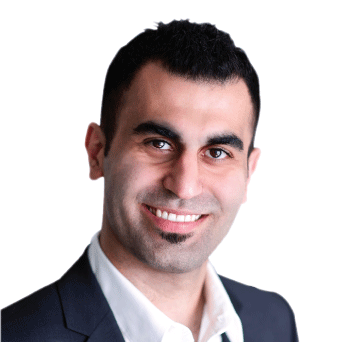 Vahid Shababi is the VP of Business Development and Marketing at PerfectMind. In addition to developing marketing strategy and new partnerships, he works closely with internal product development and customer experience teams to ensure our software continues to meet the needs of our diverse community of clients. Vahid has presented some of our most popular webinars educating school owners on growth strategies and operational efficiency. Pei En: Hi everyone! Thank you so much for joining us today. My name is Pei En and I'm your webinar host. We're so excited to have you here for Reducing Risk in Costs with PerfectMind EMV Terminals with Vahid Shababi. Before we begin, we're going to do a quick sound check. If you can hear me, please type 'yes' into the questions box chat now. Great, okay I see yes's coming in. So it looks like we're all set. Alright! So again welcome everyone! As many of you may know Vahid is the VP of Business Development and Marketing here at PerfectMind. He's presented some of our most popular webinars to date. In addition to developing marketing strategy and new partnership, Vahid works closely with the Internal Product Development and Customer Service Experience teams to ensure that our software always continues to meet your needs. In today's webinar walk, he'll walk you through the EMV transition and how PerfectMind can help your school. For those of you who are new to us, please also feel free to follow us on social media. We're on Facebook at facebook.com/championswayfans, or Twitter @championsway. If you like this webinar, you can find a bunch more on our website at academy.championsway.com. There'll also be time for questions after Vahid finishes his presentation, but please feel free to keep them coming in during the webinar and just type into the questions box. If there any other questions that we don't get to, that you have once the webinar's finished, just send us an email at marketing@championsway.com, and we'll get back to at any of those questions. Without further ado, let's get started. Welcome, Vahid! Vahid: Hello everyone! Thanks for joining us for today's webinar. I know that Pei En's already done quick sound check. If you can hear me, please type 'yes' in the chat box, I just want to make sure that everybody can hear me. And also let me know if you can see my screen, that's a blue screen and on it is red and EMV. If you can, please type 'yes'. Perfect, thank you so much. Alright, for those of you who attended my webinar before, today's webinar is a bit different. It's more educational on a product and service that is out there that you need to know about for your school to reduce costs and risk. It will be a very short and quick webinar. It's just for you to have a better idea as to what is happening in the processing world, and at PerfectMind we always try to be ahead of the curve and help our customers with the latest technologies. Before I start the webinar, I'd like to have a quick question for everybody that is in the webinar today. Can you please type 'yes' if you already have a terminal at your school, and type 'no' if you do not have a terminal you take credit card, swipe the credit card, or just put PINs when you take the transactions. I see 'no', 'yes', okay. So I see some yes's and some of the no's, and the one that said 'yes', I see some of them do not have the EMV terminal. You only have the type of terminals that you have to enter and type the digits of the credit card manually. Let's first talk about what is EMV. The EMV was introduced to the market few years ago. Basically that requires your customers to not only have their credit card in their hand in order to do the transaction, or in order to pay for the dues, but also it makes your customers to enter PINs for authentication. That's a different level of security for the credit card. This technology came out simply just because a lot of frauds were happening with duplication of credit cards or of stolen credit cards. The provider companies realize that they're going through a lot of costs and risks. So they introduce this technology to bring that down. Not only they introduced this one, and not only they're offering this one to bring the cost down, but also they're trying to pass this risk to the school owners and business owners. Since October 2015 the liability has been changed and shifted from the credit card companies to the service providers and product providers. Basically if you accept a credit card in your terminals today and you're not having the chip credit card, EMV system or the terminals, and there is some sort of fraud, they do not accept that risk. The Visa, MasterCard and other credit card companies do not take that risk. They pass it to you as a business owner, simply because since October 2015 it became a law that you need to have the micro chip credit card reader or the terminals at your school if you want to accept credit cards. Again, simply this technology came out because of the problem that they were facing with fraud and credit card duplications. So this is very important for you to know. I understand that some of you may not even have any sort of terminal at your school, which is fine. But for those of you who have terminals and it's not an EMV, you're at a high risk. Meaning if somebody walks in and use a credit card that's stolen or has been duplicated, and you swipe the credit card, if the actual owner of the credit card contact the Visa or MasterCard and let them know that, "I see a charge that I don't do," then the risk is going to go to you and you're going to have a hard time with credit card providers. Because the credit card is presence, you will get a lower rate for the credit card providers. Usually when a non-card presence, you're looking at anything within 2.09% to 3.49% that depends on the type of credit card. Some of the credit card is a classic credit card that you pay less rate. Some is the reward credit card that you pay a higher percentage as your fees to the processors. When you go with the card presence, and I understand that it's impossible for you to do the card presence for all the transactions because some of these transactions for you is a scheduled payments. For example you have a yearly contract and you want the PerfectMind system automatically process those charges for you, so those have to be non-card presence. At the end of the day, you look at the time that you're saving and all these follow ups, delinquency, and reporting, that's in your benefit to have it as non-card presence. However sometimes you have people that walk in, they want to purchase from your pro shop. Sometimes they want to purchase a membership and they want to pay it in full. Sometimes they have delinquency and they want to give you their credit card and pay for it using credit card. So for those types of transactions which is pay now and is happening at the counter or at your school, it is in your benefit to have the terminals. If you have a very active pro shop that the sales volume is pretty high, you're going to save a lot of money if you have the terminals. Because they said the percentage is as low as 1.8%. At PerfectMind we try to work with different processors to figure out which one is going to provide the best solution to our customers, from their rate and service level. The biggest difference for you of having one system that take care of everything for you is it will be easier, because if you have a non-connected terminal, when you accept a credit card from your students, you need to add that manually into the system to match the numbers with your reports. Also it doesn't show it as a delinquency. Or if you are selling a product with PerfectMind's POS and you're getting payment through another terminal and go in and add it to the PerfectMind because you need to keep track of that /. But if you go with the connected system, as soon as you get the payments, automatically it will be recorded into PerfectMind. Also at the check out at the POS, PerfectMind also works directly with those terminals so your time will be saved. You don't have to pin all those numbers, the fees and everything into the system, because PerfectMind keeps track of that. That's the main and biggest difference if you work with a terminal that is not connected to PerfectMind, in comparison to a terminal that is connected to PerfectMind. This is overall how the EMV chip works. You may ask this question - what are the rates? For the first 40 people that after this webinar coming onboard with the terminals, we talked to our processors to offer a rate to meet your rate that if you already have a terminal and they're offering you a rate, they're going to ask for your statement and they're going to meet your rate beat your rate. And if you don't have that, based on your volume, they're going to offer you the best possible rate out there. You may ask what will be the extra charges, one time charges. Again depending on type of terminal that you pick, it's going to be charged for the device that they send to you, and this terminal basically is independent of PerfectMind but it works with PerfectMind. And then if you're going to contact PerfectMind support, we can connect the terminal so you can start accepting credit cards. And not only the credit cards but also the EMV chip credit cards, credit card readers or terminals that is fully secure and your rates are pretty low, you are not taking over any risk yourself. The credit provider will have those risks. That's pretty much how the EMV chip terminal works. We started this about five or four months ago. We tested with our larger clients like some of the municipalities. After they've been working well, having all the reports and reconciling reports to make sure it works for our customers, now we also want to bring this to our martial arts industry to make sure that also works for them. So if you are interested to get more information on the details as well as the rate and steps you need to do, or you want to get onboard with this terminal, all you need to do is just send an email to marketing@championsway.com and our team will contact you and take you through the full process. If there is an existing rate that you already have, they're going to take you through the process and how to contact the processors that we work with, for them to be able to meet your rates or beat your rates and take it from there. I said today's webinar will be a very short webinar. It's all informative regarding this new service that's available out there. But if you have a terminal that's not an EMV, please contact your provider, because since October 2015 all the risk is being passed to the business owners and you're at a high risk. So no matter either you stop accepting the credit card presence or upgrade your devices, with PerfectMind or with anybody else, just make sure that you're not going to be at any risk. Now if there is any question regarding the EMV or a service, I will be more than happy to answer.